This Saturday is the fourth installment of Oh Really?! 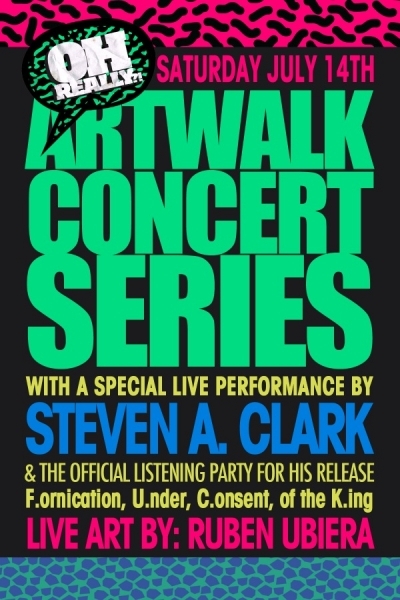 art walk concert series, and this month features R&B singer-songwriter Steven A. Clark, and Ruben Ubiera who will be painting live. Steven is a top forerunner in the Future R&B movement, spearheading a confident and new type of indie-rock and hip hop infused rhythm and blues that belies his young age. The Fayetteville, North Carolina native broke onto the scene in 2010 with his soul-baring and darkly arranged eight-song LP debut STRIPES. Steven is now working on his sophomore album, Fornication Under the Consent of the King, which was released last month on L & E Media Co. His presence in Miami is easily associated with the national likes of his genre like The Weekend, Frank Ocean, all the glamour that this new indie R&B had to offer. Ruben uses his innate taste of pop in urban settings and inspirational skateboarding to bring to life a culmination of street art, pop art, and collages atop any materials he can find to resuscitate surroundings. Oh Really!? DJs Marc Adam & CHALK will be spinning some outdoor funk before and after Steven’s set.